Scary Monsters magazine #38 - A Creature Like You've Never Seen Before! 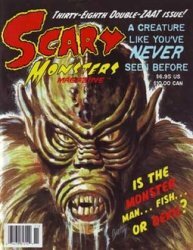 MyMovieMonsters.com > Scary Monsters Magazine > Scary Monsters 1-100 > Scary Monsters magazine #38 - A Creature Like You've Never Seen Before! This is the Thirty-Eighth Double-Zaat Issue of Scary Monsters, published in March 2001. Each copy is new, uncirculated. The Giant Gila Monster: Unsung Classic or Classic Bomb?